Reliable as always. Fast shipping! Beware in Indiana charged me sales tax No Michigan tax No. provided. Unfair!!??? Shipped a $400 order no signature FedEx left on my porch GLAD it wasn't STOLEN!! Canceled my order for no reason after I paid, they should be banned from ebay. VERY POOR CUSTOMER SUPORT, CANED ORDER WILL SHIPWHAT I BOUGHT OR REFUND. Order was cancelled by the seller. Probably not going to order from newegg again. Was supposed to be be delivered by 2-14-19... It's 2-15-19 and its not here. The seller input the incorrect address, I never received my item! Well, this one doesnt work. Also very poor communication. FAST! BEST BANG FOR THE BUCK! I use to be an intel only type of guy regarding processors. I went thru all the pentiums 1-4 and then went core 2 duo and then finally ended up core 2 quad settling on a Q9650 that lasted me for years. Well technology finally hit that wall where I needed to upgrade to something better. I've had exprience helping friends build budget PCs and dabbled with AMD triple and quad cores and they seemed decent. I upgraded wifes gaming computer from a q6600 to phenom x4 and performance seemed on par. When she needed that upgrade I kicked it up to a FX-8350 for her and that blew it out of the water for me. Octacore that kept up to my q9650?!? Well I saw the prices dropped on this FX-8370 and i jumped on it. Upgraded to a 990FX sabertooth board and 16gb of ddr3 and I think this will last me another few years and cost me barely $250. a new core i7 setup.... geez i dont want to even imagine! That Q9650 setup I had cost me over $1500 back then. Sometimes the latest and greatest from intel is overpriced. Works well, but AMD needs to redesign the fan assembly. The Processor works as intended. The fan assembly will not fit on the older MSI or ASRock motherboards. I knew this when I purchased this processor so I has purchased a Freezer Pro 7 cooler to go with this processor. There wasn't enough room to explain the bent pins on the CPU. There wasn't any signs of damage on the package so I can't really blame NewEgg or shipping. I used a credit card to gently straighten the 12 or so pins that were out of alignment just enough to get it to slip into the socket. It powered up fine and is running. Shipping was rather poor on it and travelled around the US to multi depots before getting transferred from FedEx to USPS. It made it and it works so I am relieved. good price, got it in 3 days used it to replace my old phenom, was the cheapest best option. and its still pretty decent for gaming and over clocking it. 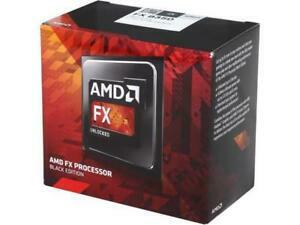 AMD FX-8370 black edition, cost effective 8 core with true 4 GHz power, two thumbs up. The AMD FX-8370 is work horse, performs better then expected. I bench test only the FX-9 series is better, but most boards will not handle. It does run little hot, need a good heat-sink. The one comes with it, is standard AMD heat-sink. And fan was buzzing away trying to keep it cool. It seems to love the ASRock motherboard. I not over clocked, it's already set really high bench marks.